To fully know a fire one must see it from all sides, all perspectives. We must listen to others’ perspectives and points of view and mesh them with our own in order to get the bigger picture. The fire, of course, is symbolic of greater truths. With this visual aid I am able to speak with people about truly listening to what others have to say, in order to learn from them and to mesh the beliefs and perspectives together into a wider, stronger and wiser view of the “truth”. Sitting in a circle, I have individuals each describe the fire “as they see it”. The heads nod in agreement as each description is presented, and the “truth” becomes fuller and richer as we work our way around the circle. 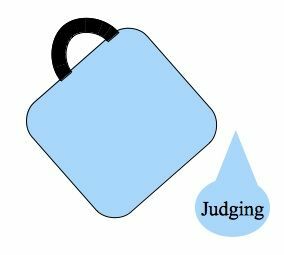 When speaking about something specific, rather than the inscribed words, we used words that depict the individual’s perspective of a situation and then contemplate the perspective of those who may be sitting on an opposing side. I cut some branches into manageable lengths of wood, approximately 6” in length. I sanded a small section on the drum sander, creating a flat surface for the pyrography. Very nice… It seems a shame to burn those particular words, though. I can think of some other words that deserved to be burnt. perhaps those words are the buckets of water that get thrown on the fire, in an attempt to douse the qualities inscribed on the fire wood. That was so COOL… I loved your… “Are you listening?” at the very end… Very nice! Very Cool! Nice use of visuals! Excellent use of visuals in a teaching moment. interesting to read people’s different perspectives of the fire. I guess that just validates the message! thinking about what they want to say or write rather than paying attention to what is being said or written. I like it, .......truthfully . yes, Bluepine—people often “talk” without any intention of gaining new insight or information. I listened to a really good “Ted Talks” presentation about “conversation”. To have a conversation about something means you enter into the discussion with the goal of sharing perspectives and information and learning from the other person. That is a beautiful way to visualize life, and yes many fires would have died if we just saw it from all sides before we throw in gasoline. I think today most people are too busy to get to a conclusion so they forget the idea of conversation as a way to reach higher than they can alone, the conversation is the key to share and then we can conclude once it is over, each our conclusion each our path.